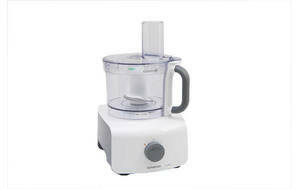 Snapshot: The Kenwood FDP641WH food processor has 2 speeds, but no storage for attachments. How does it rate? Excellent at slicing carrots and kneading pastry (with the processor blade). Just OK at emulsifying mayonnaise. Unit can move on the bench when processing at high speed. Processor blade performs better than dough blade for kneading pastry.